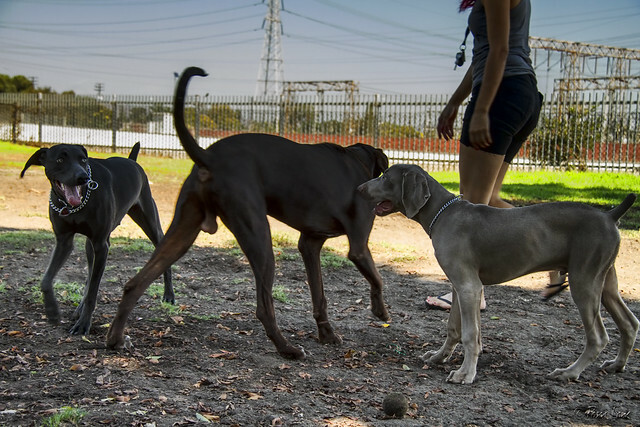 It's been a while since we've visited the dog park at Rio San Gabriel Park. It's gotten a bit dustier since the last time I visited. But these frisky puppies didn't care. Luna and Bruno, two Weimaraner puppies (9 and 4 months, respectively) enjoyed playing with this very playful German Shorthair Retriever. At 8 months old, he already towered over the other two, but he was so excited to make friends.